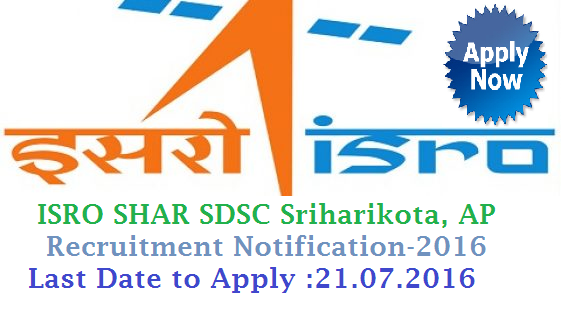 SHAR Sathish Dawan Space Centre ISRO Indian Space Research Organisation Recruitment Notification-2016 ISRO SHAR SDSC Recruitment Notification 2016 Satish Dhawan Space Centre SHAR is one of the lead Centres of Indian Space Research Organisation and situated at Sriharikota in Andhra Pradesh. Satish Dhawan Space Centre SHAR has a unique combination of facilities of Solid Propellant Production Plant, a Rocket Motor Static Test Facility, Launch Complexes for variety of rockets, Telemetry, Telecommand, Tracking, Data Acquisition and processing facilities and other support services.53 Technician & other posts - ISRO Satish Dhawan Space Centre – SDSC – SHAR Satish Dhawan Space Centre SHAR (ISRO) is inviting application for the posts of 53 Technician, Draughtsman & Fireman in various specialised fields. Draughtsman : No. of posts : 2, Pay scale : Rs.5200-20200/-, Grade Pay : Rs.2000/-. For Technician : SSLC/SSC pass and ITI/NTC/NAC in relevant Trade.For Draughtsman : SSLC/SSC pass and ITI/NTC/NAC in Draughtsman(Civil) Trade.For Fireman : SSLC/SSC or its equivalent and Should satisfy the prescribed Physical fitness standards and endurance test standards. How to apply : Interested candidates may apply Online at http://sdsc.shar.gov.in/ from 02.07.2016 to 21.07.2016.